The city of Karachi in Pakistan presents a unique situation in which the land that falls under the physical boundary of the city is controlled by fifteen land owning agencies. The city government controls only 31 percent of the land. Most of the highly valued land of the city falls under the jurisdiction of two agencies; the Defence Housing Authority and the Co-operative Housing Societies. 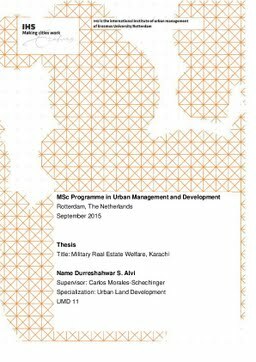 DHA, being an authority rather than a co-operative, being larger in the amount of land that it controls, and established as a welfare system for the military, hence, is a more interesting and unique specimen to study in terms of land development and the real estate process. The exploratory study circles around to what extent DHA uses the different stages of the real estate process (land acquisition, land regulations and land leasing) and its resultant high value of land to provide welfare to the military officers of the country. A case study approach is adopted to study the causal relationships in this phenomenon and both qualitative and quantitative data are used, extracted from both primary and secondary data sources. DHA phase 8 is used as the sample area and military officials who have received welfare through first hand allotment in this phase have been the primary source of information among others. The data reveals the partial success of the system through their cases in receiving welfare benefits as the initial investment into obtaining the allotment is higher than the value of the land within the first ten years. This makes the welfare exclusive to the officers from rich backgrounds that have savings to not only buy the land in the first place, but also are able to incur the development charges. The study discusses policy recommendations that can aid in improving the efficiency of this process to make it more encompassing thus providing welfare for all.